Review: The Hornby Skaledale Pillar Box (Post Box) is a nicely detailed piece to add to your Model Railway layout. You get two pillar boxes in each pack, both have fine detailing on them. 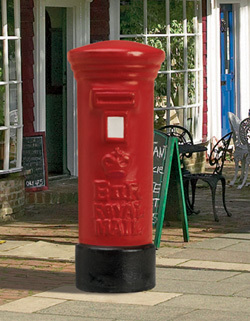 The pillar boxes are made out of poly resin to imitate the traditionally old British post box which is still seen today. Both pillar's have the queen's crest, E ii R and Royal Mail words engraved into the poly resin which makes the pillar boxes look very realistic both up close and at a distance. One pack of these pillar boxes should be enough for any Model Railway layout.